A few wines are pretty much perfect for lobster. I love a light, minerally Chardonnay from Burgundy – nothing gets in the way of the white fish and it’s elegant and simple. A pale Provencal rose is great for cold seafood lunches on the water- just something low in alcohol that washes it down and adds to your fun. And Muscadet is also a shellfish go-to because it’s acidic, crisp and clean, mildly fizzy and almost a bit salty. It’s from theLoire region and made from the Melon de Bourgogne grape. People say it’s the perfect accompaniment to oysters, and it is quite awesome with them although I prefer Champagne. 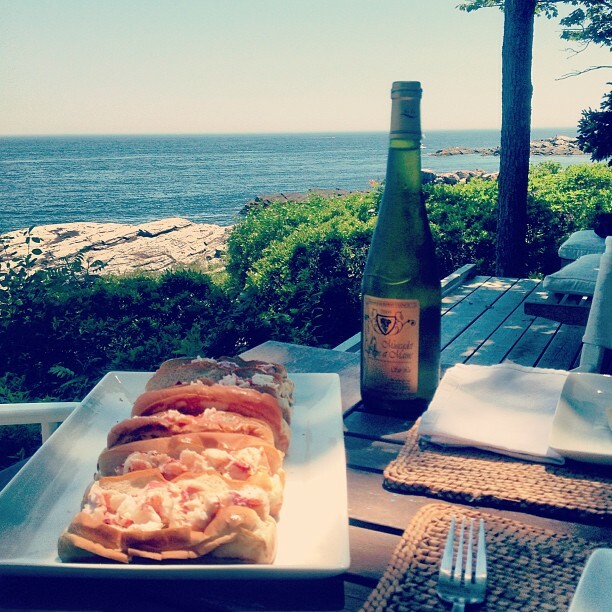 But it’s also pretty great for a lobster roll lunch. Btw, lobster rolls are so easy to make. Just mix lobster chucks, a tiny bit of mayo, salt and pepper and put it into toasted, buttered buns. YUMNESS. Tags: champagne, chardonnay, lobster, muscadet, Rose, wine. Bookmark the permalink. Previous post ← happy 4th of july happy hour! Now I want a lobster roll and some champagne, have a great weekend! Great recommendations. Looks like the lunches we’ve been eating in the Gaspésie region of Quebec this past week. They add chopped lettuce to their lobster rolls as well.